Like everyone else, I am spending way too much time on Pinterest looking up garden prep, veggie and flower varieties and what will give me the biggest bang for my buck in the northeast growing season. Standing in the yard full of snow a few thoughts occurred. 1. Winter will never end. 2. What else do I need besides flowers? There are always the practical stakes for the peonies, etc. but I want to show some personality, some individuality, some pizazz. My mother in law has a small greenhouse where she starts many of her spring flowers from seeds. Zinnia, Petunia and Bachelors Buttons to name a few. They do very well, and often I end up with multiple flats of them because she has so many. We both have some flower beds and spots for the beautiful color to be displayed, but I find myself spending more time looking at her gardens than mine. The reason? She has more than flowers. 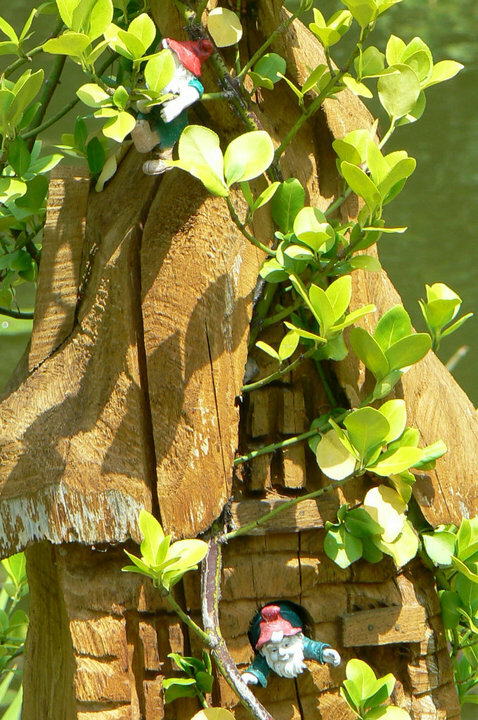 One bed has a large (3 ft) wooden gnome house, carved from a tree stump. 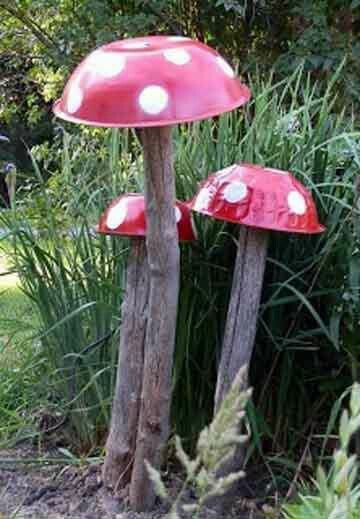 Then she has little ceramic gnomes that she puts among the plants and flowers. Even at my age (don’t ask) I do stop and look for them. She has 12 gnomes and takes the time to move them around, so the “game” is played a few times during the season. 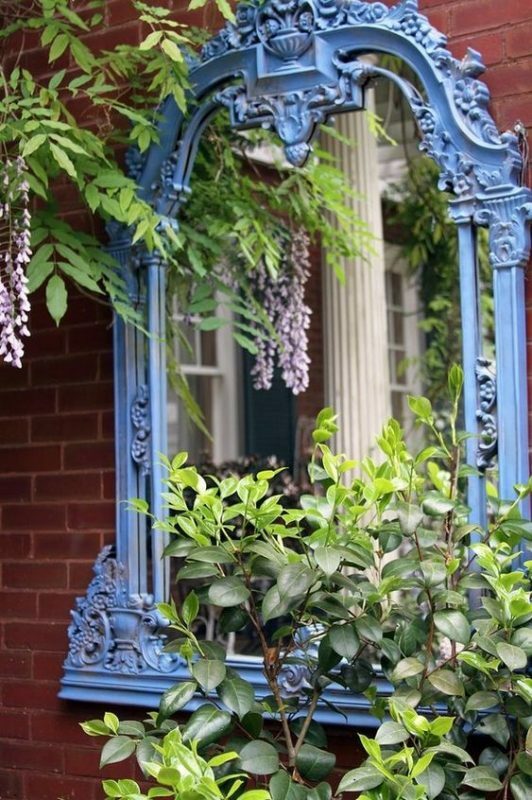 There is also the standard fence piece, trellis and the rustic upcycled garden bench she bought a few years ago. 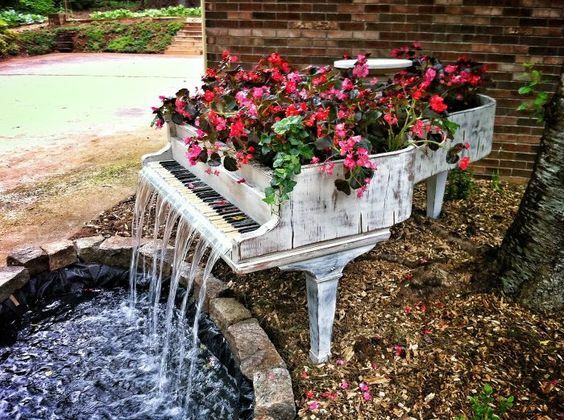 It is whimsical and matches her personality. The chandelier I found is an interesting idea. 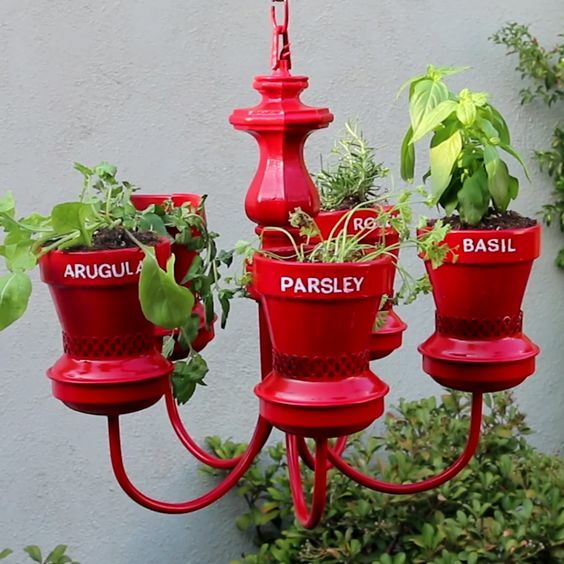 I’ve seen them pinned with solar lights in them, but not potted plants and the red, wow! 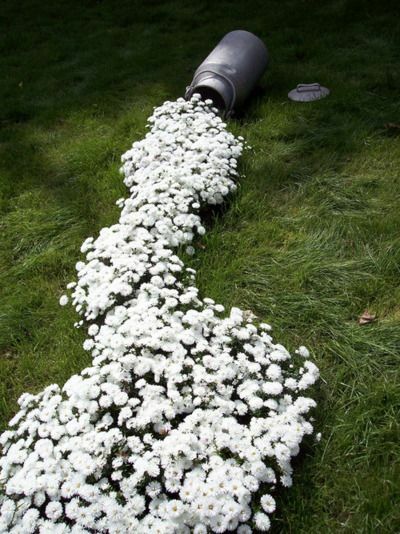 I’m not sure I could be careful or patient enough to do a waterfall of flowers, but it is beautiful, especially with the milk can. How country is that? In our fall fundraising program we have offered the allium ambassador. Looks just like the chicken wire stakes above. 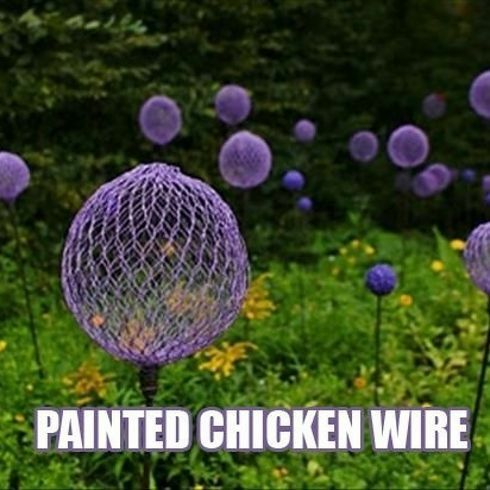 That would be a cool Lorax/Wonka type look with real allium mixed in with the chicken wire balls. The bike painted in the garden just keeps my attention. 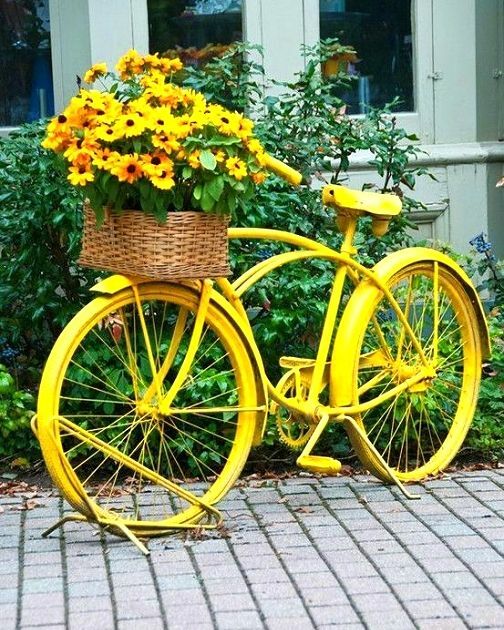 I’ve seen blue, red and this bright yellow on Pinterest, I may need to give it a try! 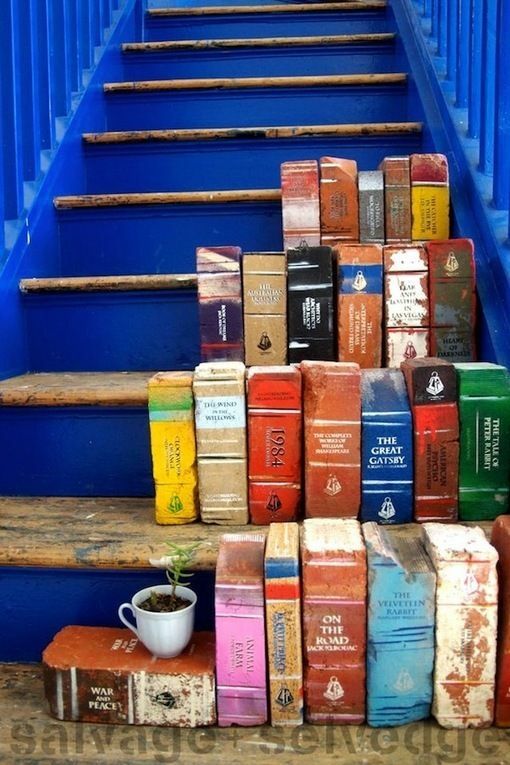 As a book worm, upcycler and lover of all things vintage, these are also on the Pinterest list! This entry was posted in Blog and Social Media. Bookmark the permalink.